As we come out of the summer months, we start to see the productivity of our gardens die back. We also see the fervent nature of our own lifestyles retreat inward as the weather becomes colder and we slow down for winter. As the seasons turn, so does our activity and the way we live our lives. This is reflected in nature and in our diets. While the spring and summer months bring an abundance of juicy fruits and vegetables, the fall and winter see us feasting on roots and chutneys. One of the challenges for the permaculturist as well as the organic market gardener, is to move smoothly through the seasonal transitions. In traditional monocropping and industrial agriculture, the fall season marks the end of the farming year, with burn backs clearing everything for the following year. Not only is this unproductive, it damages the landscape and uses up a hell of a lot of labor. The permaculturist not only seeks to repair environmental damage, they also set out to be smart about how they use their labor effectively to achieve the maximum positive impact and yield. In this sense, using the crossover between the seasons as an opportunity to create more productive systems allows permaculturists to enjoy more fruitful gardens at unexpected times of the year. Below outlines a range of techniques for season extension to help you to increase your yield throughout the coming months. Focusing on temperate climates moving from summer to fall, this article aims to give you permaculture tips to work on extending your seasons right away. Season Extension is related to the permaculture concept of utilizing edge. Seasonal crossover periods are the edges of time where life kingdoms can more markedly be seen changing as the weather patterns change. While temperate zones tend to see four seasons (Spring, Summer, Fall, Winter), nature doesn’t see the definitive boundaries of our lexicon. Instead, the seasons blur into one another as nature continues to consistently change and evolve. 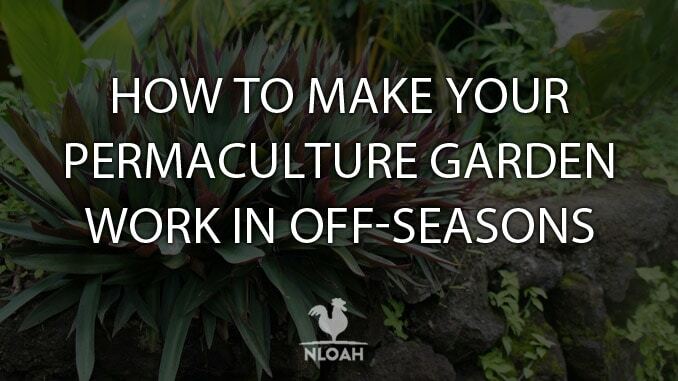 For the permaculture gardener, the change between summer and fall is one of the most obvious. Occurring in around late August to late September, the days suddenly feel shorter as the night sky arrives earlier. The warmer summer winds give way to chilly night time breezes, and the fruits come less frequently as the leaves start to blush. Unlike the industrial farmer, permaculturists don’t see this as a time to hurry up the cleaning and put down the tools in prep for winter hibernation. No, instead, these periods are seen as opportunities. More poignantly, season extension refers to pushing the length of time that is considered to be productive in the garden. While many of the techniques seek to improve or alter the microclimate to mimic the warmer seasons, some of the tools also seek to ensure we are useful humans in these more dormant periods. By extending the seasons we create an environment which is more favorable, allowing us to regenerate more productively. By pushing those seasonal boundaries outward a little, we are able to increase our food yield, prepare our gardens more effectively, and create solutions that transition those periods more effectively. Season Extension is the name given to a wide range of tools used to extend the food production season. As spring and summer are considered the most productive seasons for growing edible crops, season extension usually refers to the periods that straddle these times. The aim is to produce food sooner (before or earlier in spring) or later (later into fall and afterward). In doing this, season extension enables us to increase our overall yield per annum, while also increasing our food security over more months of the year. While season extension techniques involve many gardening ideas, the term also refers to preparation for the coming seasons through food processing and ground preparation. While enjoying delicious fruits and vegetables throughout the productive months is a real treat, ensuring to save some for the scarcer months will enable you to live more securely in the less productive seasons. This ranges from processing food into sauces, jams and chutneys, to drying fruits and meats, and distilling medicines. However, in the time-zones where summer meets fall, you’ll be focus on storing roots and vegetables for as long as possible, while also preparing for next year’s plantings. In doing this, you can take advantage of the crossover conditions, creating an extra yield for the transitional period. Using cover crops and living mulch, you can prepare the soil for the future while also providing a little extra fresh produce to eat in the less productive seasons. Now here’s the thing. Jumping right into season extension is tempting. It seems like a simple concept where you can easily craft a replica of the summertime conditions that are ideal for growing crops. However, while this is technically possible, as a permaculturist, you want to focus on conserving energy and utilizing that energy in the most efficient way. In this sense, we try to follow a few basic principles when delving into season extension. With all planting, we need to consider our choices in the fourth dimension — how will this plan out over time. In this respect, when we set out to undertake a season extension technique for a particular system, we need to conceive of the length of time this system will serve its purpose for. Short-term solutions are techniques such as hoophouses which help to raise the temperature to grow something for a few extra weeks of months. Mid-term solutions store energy in the plant. Fruit trees that store a victual in their fruit, as well as storing nutrients in their leaves, help to provide a yield over many months. Long-term solutions look at food security over a year or two; perhaps longer. Food processing, such as curing meats and making preserves can provide food sources for a year or two. Equally, preparing the soil for the future will help to dive forward in the timeline, to produce yields over many years. Working from patterns to details, we need to understand the details of the elements in our food systems. While we may want to extend the seasons to live on succulent apricots and spring leeks, we have to consider the realism and eat accordingly — in essence, planting accordingly. Extending the seasons will definitely allow you to prolong your high value summer crops for a few more weeks and months. For example, tomatoes and peppers can be grown in cold frames and hoophouses, while harvesting on the stalk and hanging them while the fruit is green will keep them ripening for a few more months. Equally, selecting perennial herbs, fruit, and nut plants will ensure that you vary the harvest times of your yields. This provides you with nuts and fruits into the later seasons. Moreover, consider the cool weather plants that exist. Getting those in the ground in preparation will ensure that you have a supply of fresh goodies as the summer crops dwindle. Think hardy greens — kale, cabbages, spinach, and so on. Not all of these techniques are applicable all of the time. This is key in permaculture design and observing your environment should be set as the foremost thing to do. Recognize what areas of production can be prolonged and which should be areas to develop for next season. Try to plan ahead, considering your next step in the timeline while in the current one. In other words, while enjoying the fruits of summer, make sure you’re storing for winter! As noted above, plant selection is paramount in season extension. While, yes, it is possible to mimic a tropical summer in Sweden, the energy needed to do this far outweighs the benefits — and it’s extremely complex! Instead, consider which plants will relish the native climate of your surroundings in the harsher seasons. Hardiness Zones give us a way to understand the environment in which each plant thrives best in. There are 26 Hardiness Zones categorizing the Unites States climatic areas. These range from 1a to 13b, and catalog the areas with winters as cold as -60F as 1a, through to those with winters as warm as 65F as 13b. The middle climates, around 6a and 6b are the most fertile climates, providing the ideal temperate climate for growing food. It is important to factor your climatic hardiness zone into your plant selection. You want plants that thrive best in your hardiness zone, both in the warmer and colder months. As season extension can allow you to devise techniques to mimic the warmer months, some of these tools can also be used to imitate the conditions in other climate zones, a category or two up or down. Below is a list of plants for temperate zones. Beans – By planting hardy beans, such as broad beans, in the fall, you’ll be able to harvest them a month or two earlier the following spring. Hardy greens and spinach – Perennial forms of spinach and hardy greens will do well in the crisp winter weathers. Protecting them from frost and the harsher weathers, you can chop these back and enjoy leaf growth into the colder seasons. Asparagus – A wonderfully perennial plant, asparagus can last up to 25 years. You can plant in autumn and but will take a long time to grow. However, once it matures, you’ll be enjoying asparagus throughout the cooler months in the coming years. Carrots – You can actually grow carrots in winter but they do need a little work. They need to be kept in a greenhouse or cold frame, but can be grown throughout the colder seasons. Broccoli – You need to plant early in the spring, but broccoli will last well into the fall. You’ll find it matures in about 55 days and will keep producing heads if you leave the leaves on. Cold frames, tunnels, and greenhouses all take advantage of the same effect — commonly known as the greenhouse effect. This is where the radiant heating rays from the sun are trapped inside the structure, absorbed as heat. This raises the temperature inside these structures, mimicking the warmth of growing seasons. Cold frames are the simplest and least expensive version of this concept. Cold frames look like mini greenhouses and can be easily and cheaply constructed from wood and transparent plastic, Perspex, or glass. By adding a cold frame to your garden, you can plant earlier, giving you a spring yield at least 3-5 weeks earlier, and a fall yield at least 3-4 weeks later than usually. Moreover, in the winter months, you can take cuttings of your perennials to save them in slightly higher temperatures, just in case they suffer in the cold weather. Low tunnels are pretty simple to install but take quite a lot of manpower. They are easy to make yourself and you can buy them (often called polytunnels). Make sure you look for the ones made of plastic and not netting. You need to ensure you monitor these, especially at the beginning of fall and into late spring. They tend to overheat on sunny days, even if it doesn’t feel that hot outside. Keep an eye on your low tunnels. They sit over your vegetable beds quite low and are usually relatively mobile. You can pack them away when not needed or move them to a new spot. High tunnels are considerably more expensive and while simple to put up, also take quite a bit of work. These are semi-permanent structures that may stay for a season or two. Often used in traditional farming, high tunnels can extend seasons by a number of months, giving you a couple of early months in Spring and often the whole of fall to produce, and well into the winter. The issue with high tunnels is that they are prone to being destroyed by wind and storms if you aren’t careful. Always pattern your wind paths to understand the direction that your wind comes through your site. If you place a high tunnel perpendicular to a wind path, you can say goodbye to it, as it will take off in a gust of wind. Make sure to peg it down sufficiently. Glasshouses or greenhouses are far more permanent. Conjuring Victorian concepts of botanical gardens and conservatories, greenhouses can help to extend the seasons, while also serving as storage in off seasons. Remember, that greenhouses tend to freeze in the dead of the winter, as they are wider and more open than a low tunnel. The permanence does allow you to run more permeant water systems to your greenhouses, with driplines and irrigational technology. There are a couple of extreme ways to extend the seasons and one is by utilizing greenhouses and the irrigation systems within them. As compost can reach extremely high temperatures if frequently turned, this heat can be used to heat water flowing through the irrigation system. By running a black irrigation pipe through a barrel, surrounded by composting material, the barrel and water warm as they are pumped through the irrigation. Pumping warm water into the greenhouses, especially through a consistent misting system, creates a humid environment. With this heated, humid microclimate, you can now grow more tropical and warm-weather preferring plants. Another interesting example is to use the body heat of animals to help warm high tunnels. By placing chicken tractors inside high tunnels, you can use the chickens to manure on a section of the land, while they till the ground in search for insects. Simultaneously, their body heat warms the high tunnel. In the areas not covered by the chicken tractor, you can grow veggies. Wind is one of the factors that can destroy a garden during the colder months. To extend the seasons you need to protect against the wind. This starts in the smallest of gestures, from facing your tunnels in the right direction, to the more complex tasks of building wind breaks. You can find out more about windbreaks here. Mulching is a must in permaculture gardens. Not only does mulching enrich the soil, it also aims provides a protective layer that assists with growing in the off seasons. Mulching using natural materials will feed the soil as the natural materials breakdown. This helps to also provide a cover for the soil which stops it from blowing away in drying winter winds. On top of this, covering the soil helps to keep the ground insulated. By keeping the ground, a little warmer, it thwarts frost, giving the plants kinder environments. In commercial farming, we often see plastic sheeting laid tightly across beds that are germinating in the colder seasons. This stops weeds from coming through, while the plastic provides an insulative layer to keep the soil warm. This method is very effective and can be used if monitored. Unfortunately, drying winds and cold temperatures can cause the plastic to degrade, which can result in traces of plastic being strewn on your site; just be aware of this. Season extension isn’t something you think of as the leaves start to turn. You should be considering the extension of your eating periods throughout all the other seasons, as this helps you to keep preparation techniques in the forefront of your mind. In the summer, you will be abundant with fresh fruits and vegetables. More often than not your yield is far higher than you can cope with. Unless you’re a market gardener, you are likely to find yourself with surplus produce. The third ethic of permaculture invites you to share your surplus, and while this is extremely important, you must first consider your year-round needs. With this in mind, before giving away your leftovers, makes sure to jump on the preservation bandwagon. There are myriad ways to preserve, from curing meats and drying fruits to making jams, chutneys, sauces, oils, vinegars, and alcohols. Part of the job schedule for a fall-time permaculturist is preparing the soil to head into winter and to be ready for planting next spring. By getting ahead of yourself, you can ensure that by next spring, your soil is packed full of nutrients. This allows early plantings and the use of season extension techniques in the early spring as well as late fall. While smothering your garden in kelp nutrients and other manufactured boosters is easy, there are more efficient, natural, and effortless ways to go about this — that are often far cheaper. Mulching is one of the most important tasks that a permaculturist undertakes. Luckily, the fall season brings an abundance of mulching materials when leaves start to spiral down from the branches. While you can let these fall to decompose under trees, feeding the nutrients back, you can also use this resource to improve your future vegetable beds. By raking up your leaves, you can spread them across your fallow veggie beds, which will allow the foliage to decompose and add nutrients into the soil. Combining this technique with chicken tractors will ensure that your soil gets high carbon from the decomposing brown leaves and high nitrogen from the manure of the chickens, who also till the soil. Working similarly to animal manure, winter manures are designed to feed the ground by adding (mainly) nitrogen, along with other mineral and vitamin additives. While you can purchase winter manure seed packets from seed venders, cultivating your own mix will allow you to add in some edibles. Winter green manures not only serve to prevent weeds from taking over, they also feed nutrients back into the soil via their leaf drop and their root systems. Moreover, they prevent soil from blowing or washing away, as well as giving us a source of winter animal fodder and often human food. Clovers, hardy beans, and cold-weather peas are a great option for adding nitrogen to the soil. As they grow bigger, cutting them back and laying the waste on the beds will allow the nitrogen to leech into the soil for other plants and organisms to feed on. Buckwheat is great winter manure. It deters pests as well as attracting beneficial insects. Not only is it a great animal fodder, humans can also eat it. Buckwheat, interestingly, works to extract phosphorous from insoluble sources, putting that phosphorus into the soil. This boosts plant growth. Many people grow vetch in the colder seasons as a winter manure. It retains soils moisture, while promoting good drainage for the soil. The vetch will also hold nutrients, which, when the plant is cut down, leech into the soil as the vetch greenery is spread on the beds. Remember you can intersperse with hardy winter greens for edibles. These will also keep out weeds, and hold the soil, while retaining moisture. You want to remove your annuals crops as they clog up the soil. While they will break down over time, adding them to a compost pile can speed up their breakdown process over the fall season. As it turns to winter, you can then spread this compost over your fallow beds to let it sink in over the colder periods. If you let leaves fall on to your pond over the winter months, you’ll end up with some issues for the life inside it. The leaves will cover the sunlight, leading to an algae issue, while the lack of sunlight will kill off underwater plants that feed the wildlife. By netting your ponds, this will help to keep a healthy life system flourishing inside, while the leaves will provide a great source of mulch material. Moreover, you can scrape the bottom of the pond and add some of this material to the garden. The bottom of ponds is often filled with plant drop and fish feces. These two things work wonders to improve the soil and prepare for the next year’s growth. Season extension is an important move toward year-round self-sustainable food security. 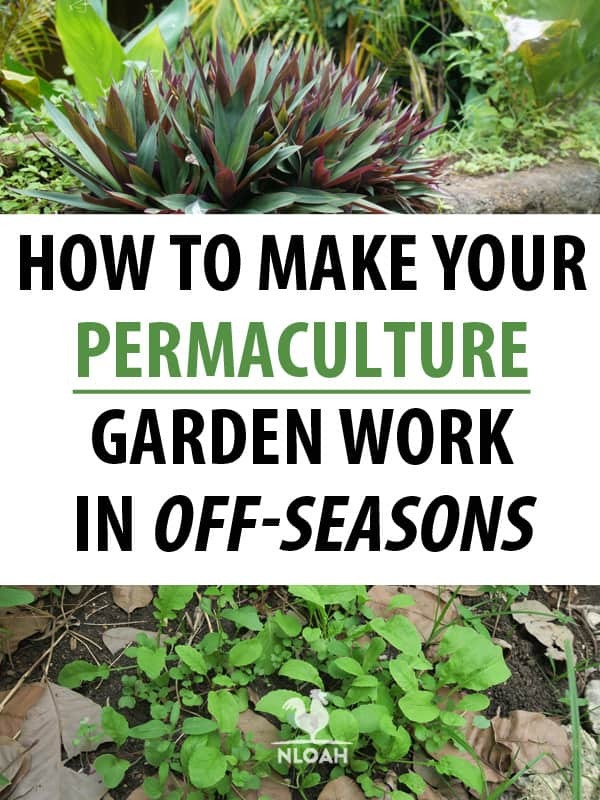 For the survival gardener and the permaculturist, season extension enables you to use creative methods to channel energies (such as solar and wind) to mimic the conditions of more favorable growing seasons. 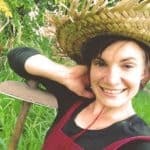 Using your knowledge, observations, and flair, you can design self-perpetuating systems, such as self-seeding green manures, that ensure you have edible crops across more months, while also preparing your ground for the next seasons, and keeping your family in varied foods.